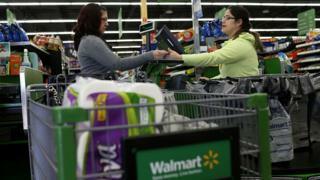 A group of US retail giants including Walmart, Target and Costco has asked US President Donald Trump to reconsider imposing tariffs against China, saying they could hurt American families. The US is preparing to slap annual tariffs worth up to $60bn (£42.7bn) on Chinese imports, according to reports. The potential tariffs would be against Chinese consumer products, telecommunications and technology. Some tariff measures could be unveiled as soon as Friday, reports have said. The group of US retailers wrote to Mr Trump on Monday urging him to carefully consider the impact the tariffs would have on consumer prices and American families. The letter was organised by the Retail Industry Leaders Association (RILA) and is signed by 25 retail giants. “This is not American industries crying wolf,” Sandy Kennedy, president of RILA said in a statement. “Higher tariffs will mean higher costs to businesses and in turn higher prices for American families,” she said. Mr Trump argues the massive US trade deficit with China is due, in part, to Chinese firms copying US products and ideas, and either selling them back to the US at a lower price or squeezing US imports out of the Chinese market. Also, some US firms are upset about rules that require local partnerships or disclosure of intellectual property to enter the Chinese market, which they say facilitates transfer of their ideas. So, in August, Mr Trump asked his country’s top trade official to review China’s practices regarding intellectual property. Any tariffs by the US would be in retaliation to what it sees as unfair Chinese practices and is allowed under section 301 of the country’s trade act. The tariffs could affect a list of as many as 100 products including shoes and footwear, but would be chiefly be targeted at IT, consumer electronics and other products that benefit from US intellectual property, according to Reuters. What are US retailers upset about? US retailers group said they support holding trading partners accountable, but that tariffs against China would see American households pay higher prices for goods. They also said tariffs would “exacerbate a US tariff system that is already stacked against working families”. “Families shopping in our stores pay higher prices because America already levies import taxes as much as 32% and 67% on basic clothes and shoes,” their letter to the President said. How can the US do this? Under section 301 of the trade act, the government has given itself the power to unilaterally impose sanctions against countries which it decides are not trading fairly. There is some debate around whether Mr Trump will announce further tariffs, but if he does, the action would not need approval from US Congress. China meanwhile has said there would be no winner from any trade war. On Sunday, 45 US trade groups also sent a letter to Mr Trump urging him to reconsider the potential tariffs, saying they would be particularly harmful. “We urge the administration not to impose tariffs and to work with the business community to find an effective, but measured, solution to China’s protectionist trade policies and practices that protects American jobs and competitiveness,” the groups said. Earlier this month, Mr Trump imposed heavy tariffs on steel and aluminium. He said the US was suffering from “unfair trade” and the move would boost US industry. From next week, tariffs of 25% are to be placed on steel and 10% on aluminium imported into the US, however they include exemptions for Canada and Mexico.